Whether you are looking to upgrade your current Honda Accord floor mats, or gifting a new Honda owner with custom floor mats, Lloyd Mats’ are better than OEM mats. They are tailored to fit more than just the vehicle, as they perfectly go with your preferred style. Car lovers rejoice! Our floor mats are perfect for any car enthusiast on a budget or looking to splurge. Classic Loop floor mats: these mats are perfect for the avid outdoors type or the hard working Honda Accord driver. Their Polypropylene yarn makes them extremely resistant to dirt and grime. They are also easily cleanable. They come in a variety of color, stitching, or with the Honda Accord logo. These custom floor mats will fit your car perfectly. Ultimate floor mats: built for long-lasting durability. Their two-ply nylon set are guaranteed to last for years to come. These floor mats can be made completely custom with personalized stitching, color, Honda logo, or emblems. Velourtex floor mats: these mats come with TractionBac™, which makes them excellent for non-skid surfaces. The custom floor mats can be customized with the Honda Accord emblem or personalized stitching. Moreover, these custom floor mats are made of nylon yarn, which gives them a heavier feel. Everything thing about this custom floor mat option makes them a superior choice for an interior upgrade over OEM floor mats. Berber 2 floor mats: these custom floor mats for your Honda Accord are the perfect blend of luxury and practical. Their multi-layer and tight loop carpet face make them resistant to moisture and offer great non-skid backing. Luxe floor mats: these floor mats are the ultimate upgrade. These luxurious custom floor mats for your Honda Accord come with a lifetime warranty, which is a testament to their durability and design. Their urethane core makes them flexible while offering extra cushion and road noise suppression. The ultra lush design offers half inch of carpet face that are stain resistant. Lloyd Mats Store carried a variety of custom Honda Accord floor mats for your needs, aesthetics, and budget. Check them out! Lloyd Mats Store also offers superb all-weather mats that come in assortment of colors and styles to fit your Honda Accord. All-weather mats are perfect for protecting the carpets of your vehicle from snow, rain, mud, dirt, detritus, and anything your feet might track from the outside. The daily driver can appreciate the cleanliness all-weather mats for a Honda Accord have to offer. Imagine being able to quickly pull out your floor mats to clean for whatever reason. Whether it be spilt milk, coffee, litter, trash, or anything else. Our rubber floor mats or our vinyl floor mats can be hosed, scrubbed, and dried with ease. 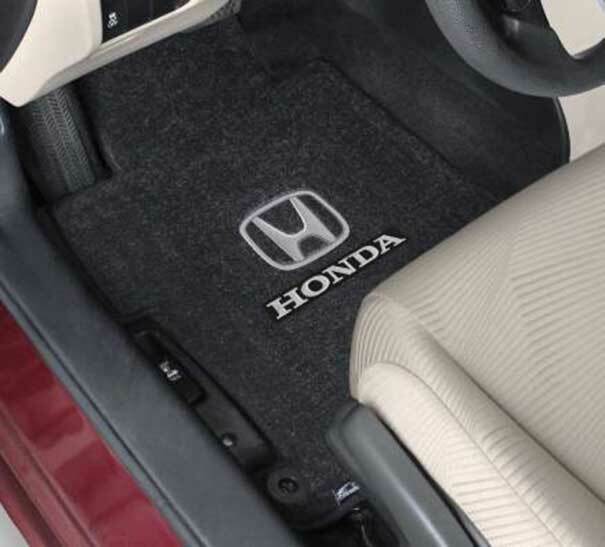 Our all-weather Honda Accord mats will fit your vehicle perfectly just like any standard OEM floor mat.